DNA contains the instructions for life, encoded within genes. Within all cells, DNA is organised into very long lengths known as chromosomes. In animal and plant cells these are double-ended, like pieces of string or shoelaces, but in bacteria they are circular. Whether stringy or circular, these long chromosomes must be organised and packaged inside a cell so that the genes can be switched on or off when they are required. Working together with colleagues in Spain, Japan and Australia, researchers led by Luis Serrano, ICREA research professor and leader of the Design of Biological Systems laboratory at the Centre for Genomic Regulation, focused their attention on the organisation of DNA within an organism with an extremely small genome - the pneumonia pathogen Mycoplasma pneumoniae. Its circular chromosome is five times smaller than that of larger bacteria such as the gut bug E. coli. Using a technique called Hi-C*, which reveals the interactions between different pieces of DNA, the researchers created a three-dimensional 'map' of the Mycoplasma chromosome. 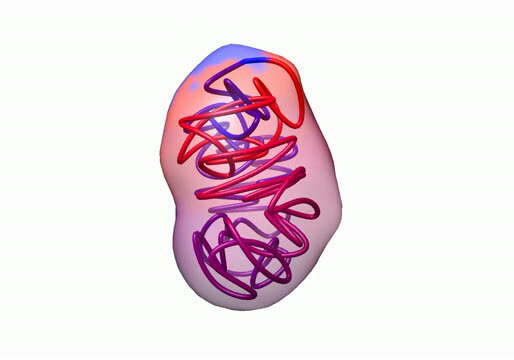 They then used super-resolution microscopy to prove that this computer-generated map matched up with the real-life chromosome organisation inside bacterial cells. Notably, the CRG team, which counted with the expertise in Mycoplasma from the Serrano's laboratory and the collaboration of the ICREA research professor Marc Marti-Renom at CNAG-CRG, discovered that Mycoplasma's circular chromosome is consistently organised the same way in all the cells, with a region called the Origin (where DNA copying begins) at one end of the structure and the midpoint of the chromosome located at the opposite end. 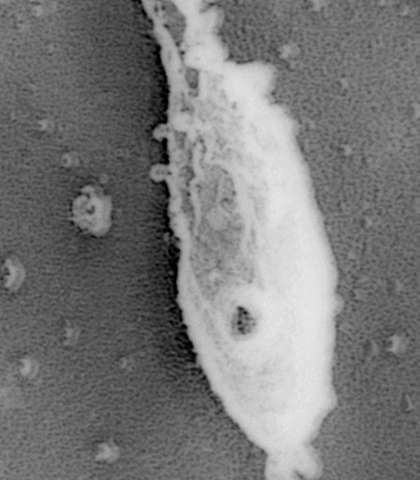 This is a similar arrangement to that seen in some other larger bacterial species. The scientists also used the Hi-C technique to study more detailed patterns of organisation within the Mycoplasma genome. In recent years, scientists all over the world have investigated the organisation of chromosomes inside cells from species ranging from larger bacteria to human. Next Generation Sequencing has allowed scientists to 'read' the DNA sequence of any genome, but this doesn't reveal how genetic information is managed and organised in the crowded and bustling biological environment inside a cell. Now, new tools have revealed complex organisational structures within the genomes of larger organisms, with certain regions of chromosomes clustered together to form domains containing genes that are switched on or off together. However, it was thought that these domains would not be found in Mycoplasma, because its genome is so small and it only makes around 20 different DNA binding proteins responsible for organising the chromosome, compared to the hundreds made by other bacterial species. Intriguingly, the CRG team found that even the tiny Mycoplasma chromosome is organised into distinct structural domains, each containing genes that are also turned on or off in a co-ordinated way. Marie Trussart, the lead author on the paper, said: "Studying bacteria with such a small genome was a big technical challenge, especially because we were using super-resolution microscopy, and it took us five years to complete the project. We had suspected that the Mycoplasma genome might have a similar overall organisation to other bacteria, but we were completely surprised to find that it was also organised into domains, which can be considered as regulatory units of chromatin organisation and that we had identified a previously unknown layer of gene regulation. This research shows that the organisation and control of genes cannot be understood by just looking at the linear sequence of DNA in the genome. Indeed, to get the full picture of gene regulation we need to look at the three-dimensional organisation of the chromatin that also coordinates gene activity." The discovery suggests that this level of organisation and genetic control is common to all living cells, from the largest to the smallest, and can be achieved with little more than a handful of DNA binding proteins and the structural properties of the DNA itself. The CRG team has been working for a long time to achieve detailed quantitative analyses of Mycoplasma pneumoniae at every level: from genetics to metabolism, including patterns of gene activity and protein composition, and more. They plan to use these findings to inform research focused on controlling and manipulating gene activity in genetically-engineered bacteria, which have many important medical and industrial applications.